Real Estate Regulation and Development Act, 2016 was enacted by the legislature after almost a decade of Real Estate being without any rule or regulation. The law was implemented in the light of the sector being abused by the powerful builders who left no stone unturned din order to harass the homebuyers. Since, its implementation the situation is improving but the improvement is at snail pace but as they say something is better than nothing. MAHARERA keeping up with the spirit of the Act recently has passed an order asking the builder to pay a sum of Rs.1.5 Lakh as penalty to the RERA authority for not registering the sale agreement. Section-13 of the Act which states “A promoter shall not accept a sum more than ten per cent of the cost of the apartment, plot, or building as the case may be, as an advance payment or an application fee, from a person without first entering into a written agreement for sale with such person and register the said agreement for sale, under any law for the time being in force……………………”. The Language of the Section clearly shows that how the registration of agreement to sale is mandatory for collection of money beyond the cap of 10%. The complainant Manish Bhagtani approached MahaRERA seeking directions against Ghanshyam Properties, to execute the registered agreement for sale under section 13 of the RERA act. He wanted this for the office premises he had booked in the developer’s project known as Link Plaza, situated at Andheri. The complainant further contended that the builder did issue an allotment letter but has failed to execute any agreement to sale since then. After, hearing the parties the Authority was of the view that the builder stands in contravention of Section-13 as it was booked way back in year 2007, but no agreement to sale has been executed and also the builder has collected money more than 10%. In lieu of the same the Authority fined the builder for Rs.1.5 Lakh and asked to execute the agreement at the earliest. Such penal actions being fastened by the Authority will give loud and clear messages to the defaulting builders. 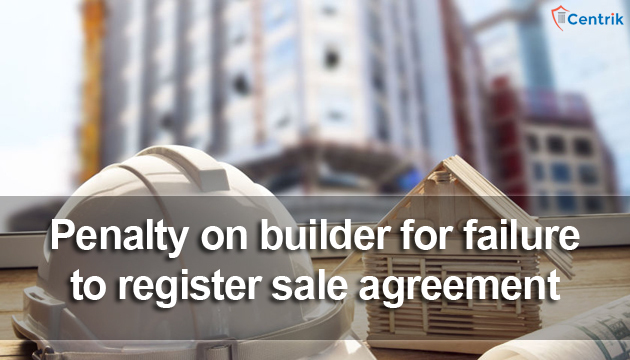 Builders who have been taking the law lightly for a while now, will understand the power and authority of newly implemented RERA Authorities.